Closed-canopy tropical moist forest once covered large parts of southern Nigeria, where some of the earliest ecological studies of tropical rain forest were carried out in the 1930s (Ajayi, 1998). Since that time, excessive logging and conversion to plantations and farmland have caused major losses of natural forest. Although no longer a pristine wilderness, the Okomu Forest Reserve still supports a small population of forest elephants and several species of threatened primates, including a viable population of the rare white-throated guenon, a monkey endemic to southwestern Nigeria (Oates, 1995). The Okomu Forest Reserve was originally established by the British colonial government in 1912. It comprised 777 sq km, to which another 411 sq km were added to the north and east in 1935. From the beginning, it was planned that the reserve would be managed as a source of timber, and it has been exploited for its rich stands of mahogany. Since the 1940s, systematic rotational logging as well as “taungya” farming have been practiced in the reserve. In this forest management system, an area of forest is allocated to local farmers to be cleared and farmed, and subsequently reforested with useful tree species. The Corona satellite photograph (see inset) from 1967 shows a still-intact forest canopy on both sides of the river, which delimits the northwestern boundary of the reserve. It is likely that the whole Okomu Forest Reserve was blanketed with a continuous dense forest at that time. 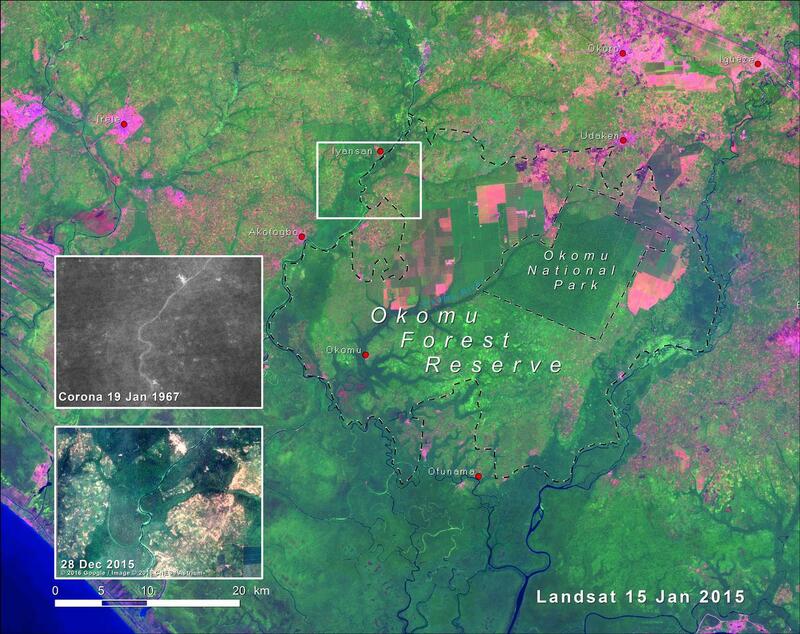 By 1984, large parts of the Okomu Forest Reserve had been converted to plantations of oil palm and rubber trees— partly as official concessions, partly illegally or only lightly controlled. A network of roads and settlements, along with farmland encroachment into the reserve, can be seen as well. Each year, a larger area of the reserve was assigned to taungya farmland. Although the taungya scheme had been envisaged to serve the local farming population, it soon attracted immigrant farmers from more densely populated areas of the country, leading to an increase in the overall population pressure on the reserve. In 1985, a wildlife sanctuary of 114 sq km was carved out of the most intact area of the forest reserve. Poaching was brought under control in the sanctuary, which is a habitat to several endangered species including red-capped mangabeys, white-throated monkeys, chimpanzees, leopards, and the African forest elephant. In 1999, the Okomu Wildlife Sanctuary was designated a national park to increase its protection from the immense pressure from high rates of exploitation and human settlement expansion on its periphery (Onojeghuo and Onojeghuo, 2015). 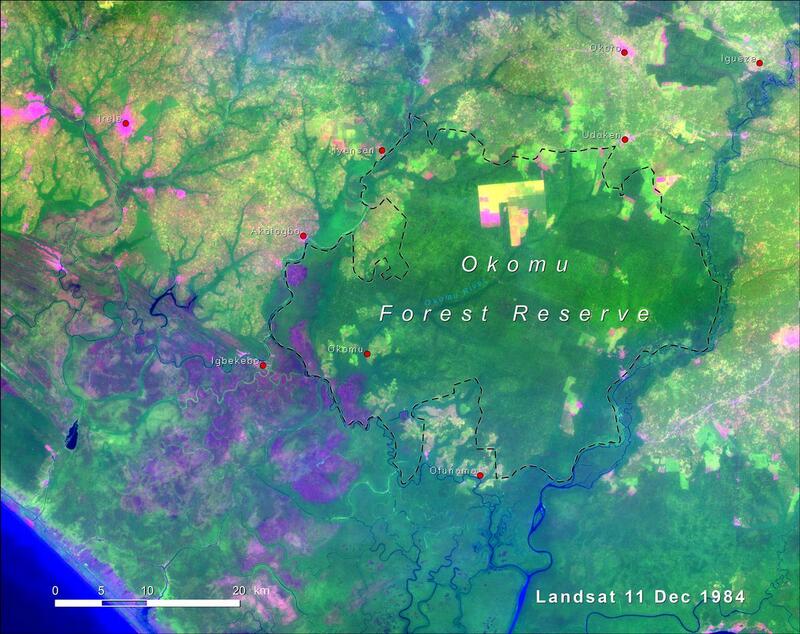 Okomu National Park remains the only fully protected part of the reserve and stands out against its surroundings in the 2015 Landsat image. The visible impact of rapid plantation expansion can be seen in the northern half of the reserve, which is dominated by large-scale rubber and oil palm plantations, whereas farmland has colonized the southern half. Efforts have been made to provide sustainable livelihood opportunities to local communities, including controlled logging and hunting, reforestation, livestock rearing, and agricultural practices compatible with forest conservation. However, Okomu’s status as a national park has not fully prevented the effects of deforestation within and around the reserve. Multipurpose forest management has been praised by some, but others have criticized it for neglecting protection efforts, arguing that integrating a development component has put Okomu at risk of ecosystem degradation.